Without doubt, the Business Today-MDRA Best B-schools ranking is the most exhaustive and robust ranking of its kind in the country. 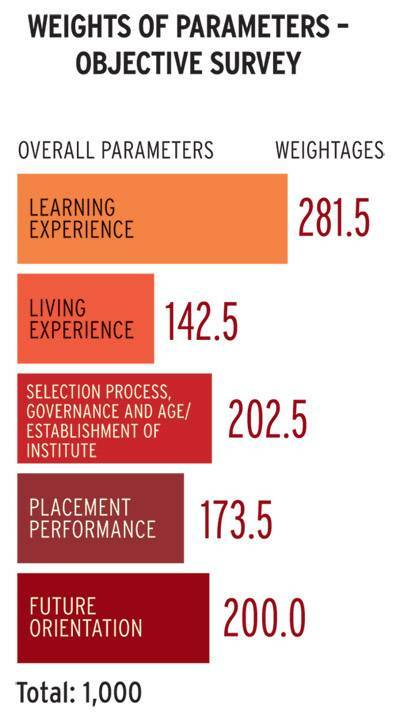 The fact that it is also the largest - we have had 267 B-schools ranked this year - is just incidental. This strength is derived from the unique and powerful methodology devised by BT with its knowledge partner MDRA, a methodology that we have not tinkered with much in the past two years except for polishing it here and there to give it more relevance and power. The Market: Recruiters from verticals such as HR, Marketing, Finance, IT, etc. A list of over 1,750 plus B-schools fulfilling the above criteria with their contact details was prepared. Also, a separate list of B-schools offering one-year full-time Executive MBA/PGP programme was updated, for a separate perception ranking. Determination of Weight-ages: Weightage for each parameter has been kept the same as last year for the sake of consistency and comparability. Objective Survey: Based on these parameters and sub-parameters, objective questionnaire was fine-tuned after incorporating new elements. B-schools fulfilling the eligibility criteria were contacted to participate in the survey through multiple ways: a) sending formal invitation along with the objective questionnaire, b) putting objective questionnaire on the websites of Business Today and MDRA to increase awareness, c) multiple e-mails, telephonic calls to remind the colleges about timely participation, and d) follow-ups to clarify any doubts related to participation/questionnaire. During the objective survey, MDRA ensured that all institutes are fully aware that there is no fee/charge for participation in this ranking. As an expression of faith in the fairness of ranking conducted by MDRA, as many as 278 colleges across the country provided their objective data, significantly higher than last year's participation of 247. Out of these 278, only 269 were finally ranked as three colleges submitted their data after the revised deadline and three were ineligible. Two institutes provided insufficient data and one institute withdrew its participation. Regardless of our strict timeline for finalising the ranking, we had extended the deadline for submission of objective data based on requests from majority of quality B-schools. Back-check of the Objective Data: After receipt of the objective data from institutes, cross-checking of the information provided by participating institutes was done very carefully through available information and validation (past data, mandatory disclosure, telephonic check, confirmation through e-mails, website visits, etc.). Institutes which had submitted insufficient/incorrect data, were contacted to provide complete and correct information. In addition, participants from Goa, Mangalore, Tiruchirappalli, Mysore, Coimbatore, Puducherry, Hubli, Tirupur, Vishakhapatnam, Madurai, Gwalior, Jalandhar, Patiala, etc., also participated in the survey. See Perceptual Ranking - Weightages for weightages of various components of the perceptual ranking. To ensure the maximum coverage of B-schools across states and zones, national ranking and zonal rankings were taken and the result was clubbed in the ratio of 75:25. Experiential Survey: The big differentiator between BT's B-school ranking and others in the market is the experiential survey. A unique concept, BT and MDRA created this element of the survey to gauge what alumni felt about their B-school education's contribution to their careers. In order to have relevance of the B-school contribution to the career, alumni who graduated maximum five years and minimum two years ago were interviewed. B-School Physical Audits (verification): Intense measures were taken during verifying and validating the objective data provided by the colleges. To authenticate any suspicious data, experienced researchers at MDRA carefully examined each and every aspect of the details provided by B-schools. To further verify authenticity of the data submitted, MDRA researchers visited 61 B-schools across the country. Over the past three years, MDRA's research team has visited 214 campuses to verify various data/ information provided by participating institutes. The responses on important questions in the questionnaire have been checked carefully. The data from the audits was then corroborated with the original documents. The irregularities that were brought to the notice during the physical audits were removed/ corrected in the final objective data. mosimageAssignment of Ranking: Like last year, MDRA has collected and evaluated B-schools on the basis of current year data to give stakeholders more realistic, updated and accurate information about B-schools. The rankings were assigned based on combined scores of perceptual survey, objective data and experiential survey. Perceptual Survey: Students, deans/directors, alumni and recruiters from the industry were identified as the primary stakeholders for the perceptual survey. The perceptual scores assigned by recruiters, alumni, deans/directors and the final year students carried weights of 35 per cent, 25 per cent, 20 per cent and 20 per cent, respectively. In addition, national and zonal ranking were given 75 per cent and 25 per cent weightages. Experiential Survey: The marks on each sub-parameter were calculated using the same weightages as in the objective survey. This experiential data was collected from alumni from colleges that submitted their objective data. To avoid any prejudice, final experiential score were adjusted on the basis of colleges' combined objective and perceptual score. Arriving at Combined Total Score: The total scores arrived from objective data, perception survey and experiential survey were added in the ratio of 50 per cent, 40 per cent and 10 per cent respectively to arrive at the final score. Thus, objective data contributed 1000 marks, the perceptual survey contributed 800 marks and the experiential survey contributed 200 marks to the total combined maximum score of 2000 marks. The total combined score obtained by each institute was arranged in descending order and the college scoring the highest marks was allotted first rank and so on. The ranking of B-schools offering one-year Executive MBA/PGP programs was based only on the perceptual data received from 328 recruiters/industry professionals and 89 deans / directors of the colleges. Only colleges offering 11-15 months Executive MBA/PGP programs were considered for the ranking. A large team comprising researchers, statisticians, econometricians, analysts and field investigators worked on this project from March to September 2015. MDRA's core team, led by Executive Director, Abhishek Agrawal, comprised Abnish Jha, Senior Research Manager and Avanish Kumar, Assistant Research Manager.